So when we went on an overnight, she carried most of her stuff. Complete change of clothes – both for sleeping or in case of complete destruction of what she’s wearing. In a stuff sack that is used as a pillow. 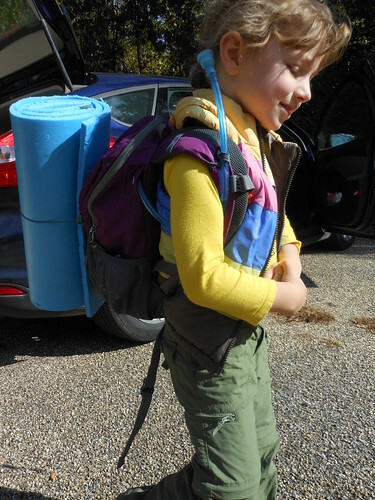 With the sleeping pad strapped to the pack, she looked so overloaded. We didn’t weigh it, but it felt heavier than I expected her to be comfortable with. I expected to have to lighten her load pretty early down the trail. And she carried it. It was only maybe 1.5 miles on a slight downhill. But she carried it. 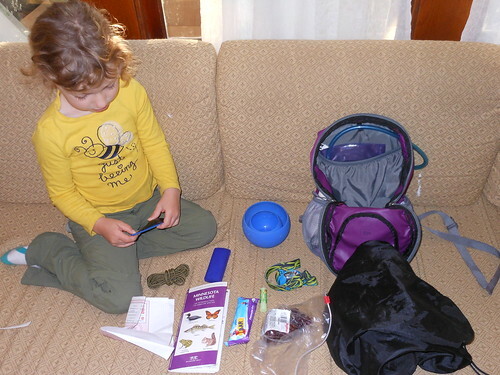 Packing up in the morning, she added her paperback chapter book, and tried to put the tent stakes in her pack. She carried everything the ~mile back to the car. Then we hit a different trail in the park, and she suggested that we should all carry our packs on that trail, too, to build up our muscles. The cord that comes on the backpack is not long enough to regularly hold the sleeping pad. What do your kids carry at what age? Did you end up weighing the pack? If so, what was the weight? We haven't actually. On paper, it's at least 2600g / 5.8 lbs. Approx 14% of her weight.